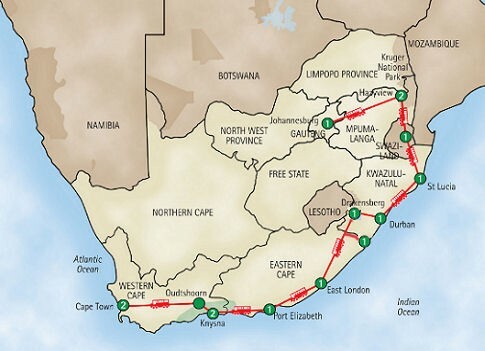 Thompsons Africa‘s South African Surprise bus tour drives from Johannesburg to Cape Town down the Wild Coast and the Garden Coast, with diversions to Kruger National Park and other interesting sights along the way. This appealed to me because it offered a nice counterpoint to the Botswana safari I was starting my tour of Southern Africa – going from Land Cruisers bouncing wildly in off-road adventures to an air-conditioned tour bus on paved highways; and from sleeping in tents at camps without electricity or running water to nice hotels and resorts with all the amenities. This South African tour was 15 days long, and it left Johannesburg the day after I returned from Botswana. Traveling for a total of four weeks (instead of 12 days in Zambia & Botswana) before returning home makes enduring those long flights worthwhile. South Africa is a land of contrasts – poor living beside rich; industry next to subsistence farming; national parks and preserves next to development; racial tolerance and intolerance; little-used train tracks next to big expressways. White farmers are “bringing along” 15,000 black farmers: selling land to them as their farming skills are developed. This is certainly a better way to integrate black farmers than the expropriation which neighboring countries used.